I’m very excited to announce that we will be having a ‘Pink Hijab Day’ here in Edmonton, Alberta! This event will be hosted by my good friend Mona Ismaeil, the owner and CEO of Modern Hejabs. When Mona first came to me asking for help in planning this event, I quickly hopped on board! Breast cancer touches so many people around the world, and it’s important that we bring awareness to this cause. So, please join us; there will be breakfast, a guest speaker, and great company. The event will take place on October 29 at 9AM to noon, and admission will be $2 per person with all the proceeds going to the Canadian Breast Cancer Foundation. Please wear your pink hijabs, and if you don’t wear a hijab, you can wear any pink clothing item. 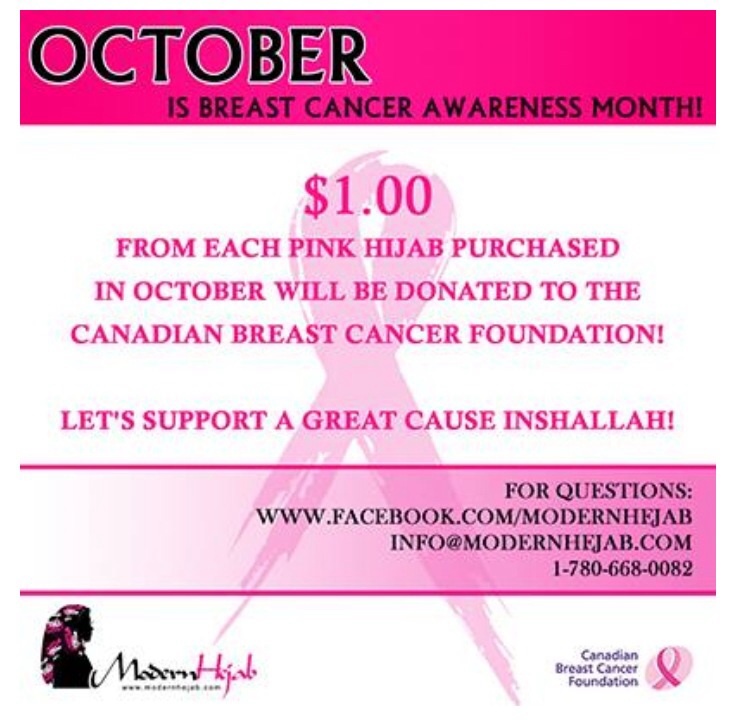 Mona is also donating every dollar from the sales of her pink hijabs, from her online store Modern Hejab, to the Canadian Breast Cancer Foundation; so if you need a pink hijab for ‘Pink Hijab Day’ please check out her online store – she ships worldwide!